When it comes to data science, the co-founder and CEO of Kaggle, Anthony Goldbloom predicted that data science centers will be soon replaced by departmental or business-specific Data Science teams. It has been found that last year’s major trend was followed from 2017 as there was the growth of Big Data, AI, Machine Learning(ML), Edge Computing, Blockchain, and digital technology. In the year, 2017 Big Data and Data Science were the themes which were surrounded and in 2018 it got drowned since the theme in 2018 got changed to “the meshing of the physical and digital world”. The latest technology in 2018 as an open source is the python and the R Ecosystems. Many cutting edge technologies and software are led by Hadoop and Hive Stacks too. Much new software today such as Fast.ai where anyone can learn deep learning fundamentals practically at free of cost. With the learnings of Francois Chollet and Ian Goodfellow, the technology in artificial intelligence has already moved on to new exciting possibilities. It will continue to become a mainstream reality in Businesses and all major industrial operations. In the Meantime, here is a blog on the Best Languages to learn as a Data Scientist. Now, Let’s take a look at promising trends that will bring new opportunities in the year 2019. 2019 will be the year where people will witness businesses across the globe implementing and exploring the mix of physical world and the virtual world. Data Science is under transitional mode, and 2019 will be the year where advance data technologies will take over routine business processes for higher efficiency and productivity. Human Data Scientists will tackle more complex problems and challenges. Data Scientists’ roles and responsibilities will evolve and the title of the data scientist will become too limiting for such diverse roles. Increased business automation won’t lead to the obsolescence of the data scientists since smart tools will offer higher capabilities to a human expert. Data Scientist will become a reinvented scientist with sufficient time in the future to explore complex business problems and advanced technologies will keep taking over the routine processes. Automated ML systems will take Predictive Analysis to the next level but there will be some steep learning curves. Chatbots and Extended reality will together revolutionize product and service marketing. All Artificial Intelligence enabled technologies will deliver a truly personalized experience to customers through interactive demos, live simulations, and visualization of custom solutions. Data Scientists will play a leadership Role in Business analytics as per “The Future Impact of Data Science on Business Analytics”. It will lead the connected machines through various unexplored paths and Augmented Analytics will revolutionize predictive intelligence. Artificial Intelligence was a hot analytics topic in 2018. AI has generated more talk than any other applications of analytics. AI would make human conversations a thing of past with real-time AI enabled conversation offering consumer satisfaction. A personal assistant like Siri or Alexa may be useful but it is very hard to distinguish from interacting with a human in the same way. According to computer Pioneer, Alan Turing’s definition – Artificial Intelligence does not Exist yet. Another professor named Gary Marcus, a psychology and Neuroscience Professor at New York University – the biggest misconception which people have is “we are very close to Artificial Intelligence”. To get an in-depth knowledge of AI you can check Learn Artificial Intelligence Fundamentals for Beginners. According to the Rexer Data Science Survey, only 10-15% of companies deploy result and another 50% only deploy often which leaves around 30-40% of the companies that occasionally or rarely successfully deploy analytical models. Some deployment rates are even less than 10%. There is no economic value to an analytical model that is not deployed. Companies will need to measure and improve deployment rates in 2019. 2018 was the stellar year for analytics and data science but there was also an explosion of AI, Neural Networks and machine learning. 2019 will be more of the same buzzwords and companies will realize that the neural network requires many examples to learn from. Each time you want to recognize a new type of item, you have to start from the beginning which is very much time-consuming. 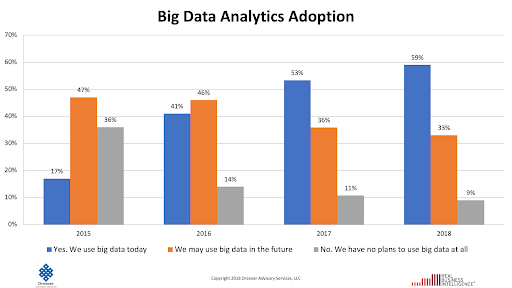 It has been found in some post of KDnuggets, Future market indicators of Data Science are a double-edged sword since advanced technologies and tools will do the jobs of Data Scientists and mainstream business users will not be able to utilize the machine-guided solutions with the help of human experts. It is predicted by Gartner that automated and semi-automated tools will deliver more analytics than human Data Scientists by 2019. Augmented Analytics will enhance Data preparation, which will extract insights and deliver predictive intelligence. The growth and prosperity of self-service BI rest on assumptions made like intelligent machines will give more superior and reliable analytics solutions than human experts. In 2019, big data practitioners would do well to retain flexibility as much as possible in their creations. While it may be tempting to cement your application to certain technology for performance reasons. It could come back to haunt you when something better comes along. Here is an Infographic giving quick insights into the Illustrated Guide to Data Science. In 2019, there will be a focus on AI ethics including privacy and security issues. There will be a growing emphasis on trying to understand various new algorithms which will lead to particular decisions. There will be growth in the use of AI/machine learning in the creation and dissemination of the fake news. Deep Fakes have shown insights where it eases for people to manufacture video showcasing people saying things which they haven’t or acted in ways. There are many ways to learn about data Science for data professionals. It can be through various boot camps, MOOCs and universities. It is expected to see growth in attempts to educate on data professionals in the way of analytics. Data science Automation will continue to accelerate but Data scientist jobs are safe from full automation. While AI progress is real but AI hype will grow faster. China has become a major player in AI with many national firms. Meanwhile, to master real-world Data Science you can opt Projects in Data Science Course.